Last Updated: March 4, 2015 By Katie 17 Comments -- Paid Promotion. Disclosure policy here. 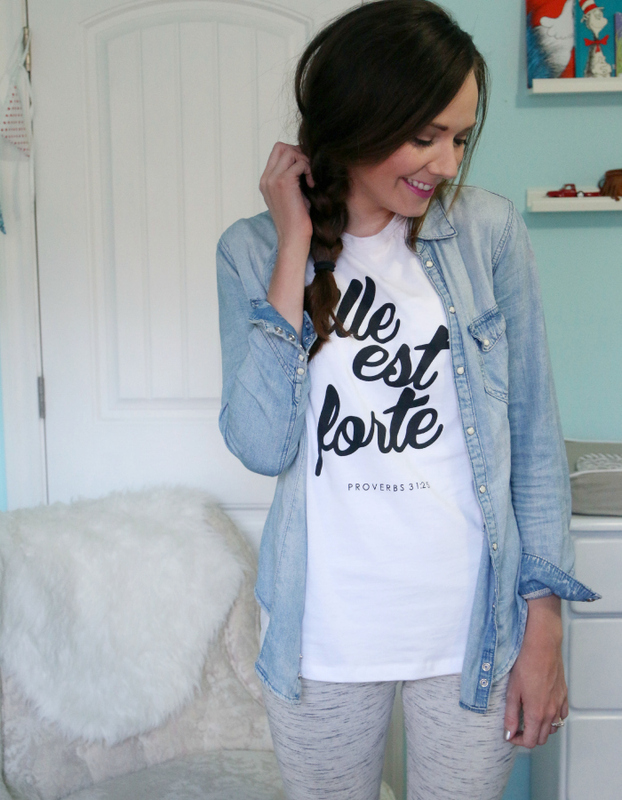 As a Christian who speaks French, this shirt really spoke to me. I mean, it’s a verse, and it’s in French. Doesn’t get much more awesome than that, in my book. You know, I never really thought I was that strong. But as I get older and experience more things, I realize how very strong I am. And it’s incredible. I helped take care of my mom during her last months here on earth. That was HARD. Not something for the faint of heart. Not something you ever want to do. Not something I ever thought I’d have to do. Then I lost my mom, and went through all of the emotions, the grief, the sadness, the lowest lows, all of it. Then I went through childbirth. I nursed my baby. All of these events were h-a-r-d, and I came out on the other side. Strong. Stronger than I ever thought possible. I can get through anything, with God by my side. I know this to be true. I’ve felt it, to my very core. And if I can be this strong, anyone can. Trust me. If you’re going through something right now- anything- just know that you aren’t alone. Know that you can get through it. Know that you are strong. Thanks Natalia!! 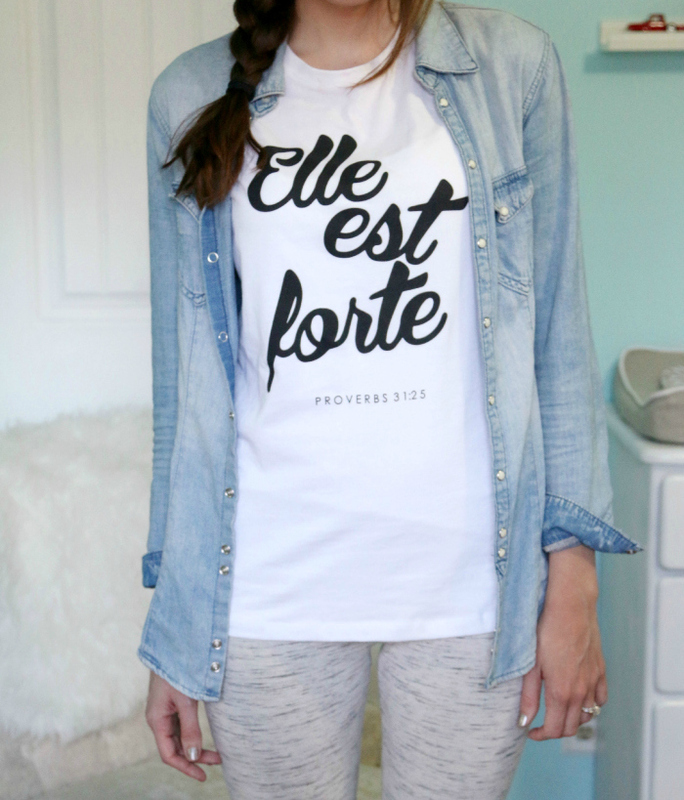 <3 Tu as besoin du t shirt!! I’ve been following your blog since right before your mom passed away. I’ve always been amazed and inspired by your strength!! I LOVE your faith and how your light shines bright through your blog!! You are an amazing person, wife, mother, daughter and friend. I’m so blessed to have stumbled upon your blog. You are definitely an inspiration and an amazing Proverbs 31 woman!! Oh, Meghan, I am so blessed by you! Thank you for your sweet words and for sticking around here with me. :) It means so much. YOU are yourself a strong Proverbs 31 woman!! Oh, Adela… Absolutely beautifully put. I agree with every word you said. You are indeed so strong, yourself! Lots of love to you. This post is lovely, just like you! Wonderful reminder. You’re a champ! I think it’s a nice reminder that with God we can do all things. i love this!! the shirt and the meaning… soo beautiful. and especially perfect for you!! !